Gwalior is historical city. If you are looking forward to spend a full day in Gwalior, our full day taxi service will help you enjoy the tour to the fullest. Visit our online portal or meet our representatives directly to avail the service or know more about it. Our exclusive Local Full Day service will suit a number of purposes such as sightseeing, attending meetings, shopping, seminars, visiting hospitals, and a lot more. If you don’t have much time to spare for a Gwalior tour, go for a half day tour plan. This will help you roam about the city and explore its beauty too. These services are also available for other local city tour usages such as include Airport Transfer in Gwalior, Car rental service for Marriage, party and event, Corporate Cab Rental in Gwalior, Railway Transfer, visiting hospitals and a lot more. Our taxi services are also designed in a fashion to provide you with pickup and drop facilities in and around Gwalior as required by you. We understand how important it is to reach public facilities on time. Hence, our trained chauffeur will reach you right at the appointed time without delay on time. 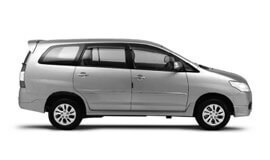 Our transfer taxi rental services include airport pickups and drops, hotels pickups and drops, railway station pickups and drops, and bus stand pickups and drops, we offer you the best. You can avail these services from Gwalior to your desired destinations. The premier outstation travel service is available for a variety of purposes including trip with friends, weekend getaways, excursions, and family leisure trip outside the city limits. Once in Gwalior, you can get expert to and fro taxi facilities for multiple destinations from the city. We offer taxi service to your desired destinations from Gwalior as the starting point. This is offered in Gwalior for multiple city visits within a fixed period of time. We offer this exclusive package to make tour experience pleasant. For a tour package that is exclusively made for you, go for our customised car rental packages. We will design a special package for you that precisely take care of your needs and budget. We guarantee the best car rental services in Gwalior at highly affordable prices. The Gwalior climate is extreme. The summers are very hot and the winters very cold. The rains in Gwalior happen only in monsoon months. During the summer months, Gwalior experiences scorching heat and with sharp rise in the humidity level. The monsoon starts in the middle of June and continues till the middle of September. As per official census report for the year 2011, Gwalior District has a population of 1,564,981 residents. Gwalior is bordered by 3 major industrial areas – Banmore, Sitholi, and Malanpur. Some of the biggest industries here include dairy, manufacturing, chemical, textiles, and other industries. The place also gathers revenue from a number handicraft and small industries. Being a prominent historical and tourism sector of the country, the tourism sector of Gwalior also contributes to the city's economy. Gwalior is rich in magnificent mementoes of a glorious past which imparts the city a unique and timeless appeal. The tourist attractions of Gwalior form a huge part of Madhya Pradesh tourism. The tourists can visit Gwalior fort, magnificent Gujari Mahal, Archaeological Museum, among many other. These lure tourists from all around the world. Some of the best tourist attractions of Gwalior include Man Mandir Palace, Gujari Mahal, Sas-Bahu Temples, Memorial of Tansen, tomb of Ghaus, Suraj Kund, Sarod Ghar, Kala Vithika, Scindia Museum, and many more.